Here is "Dannie" at a European show, after his win. 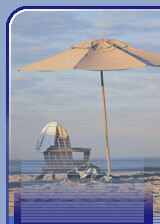 See his impressive show career and that of his progeny by clicking here. It's very easy to see Dannie's influence in our breeding program--just look at DITTO! Same excellent angulation, topline and powerful shoulder assembly.. Here's DITTO. Same excellent angulation, topline and powerful shoulder assembly. Dannie is also in the pedigrees of our Angel and Skittles. 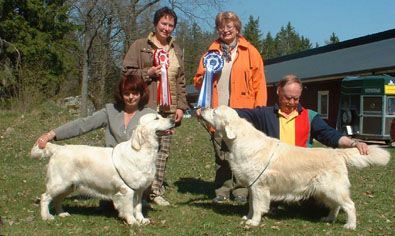 A BIS Open Dog Group, Jalla show, 2004. All Goldenlines dogs. Dannie is second from the left. Dannie is a VERY well-put-together dog! 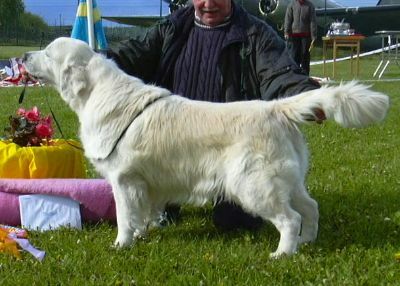 Although he is certainly lighter in color than what is commonly seen on the American show circuit, if you read the STANDARD for the breed, you can see the correctness in his structure. A powerful dog! 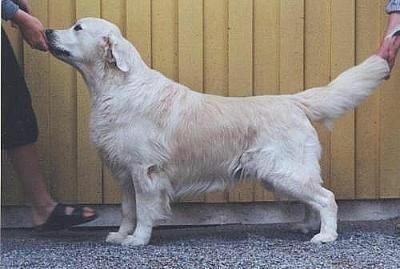 Goldenlines Dutch Duty-Free Mult CH WW-91-92-93 BEST IN SHOW Open Dog Veteran, Varsta show, 2004. Dannie is the lighter dog on the left. To see Dannie's pedigree, CLICK HERE. 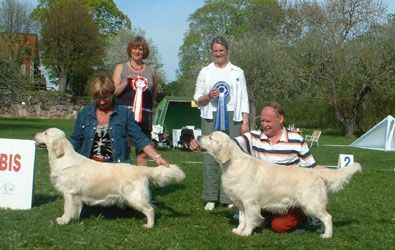 Best in show 2, Open Dog, Varsta show, 2004. Dannie is on the right. Best In Show 2, Jalla show, 2004. Dannie is on the right. 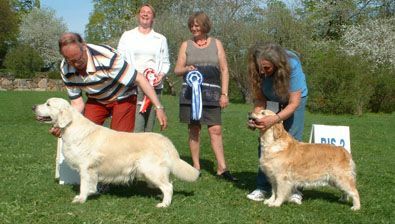 Best In Show Group, Open Dog, Varsta, 2004. Dannie is 2nd from left.